A Highland town could be in the running to become Scotland’s marine sports capital if ambitious plans to revamp its harbour are realised. That’s the ultimate vision of wide-reaching plans to develop Nairn Harbour revealed yesterday. 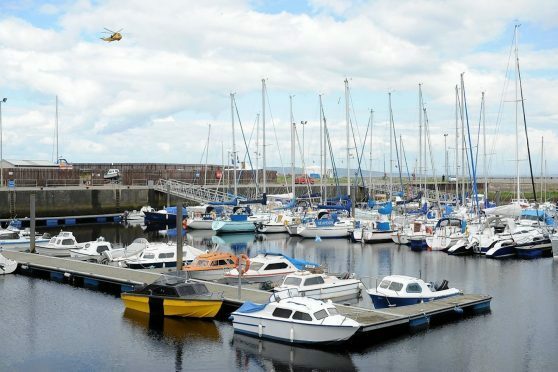 Councillor Michael Green, chairman of Nairn Harbour Working Group, said improvements to the harbour could place the town “as a jewel in the national tourism crown”. Immediate goals include opening up the harbour to more vessels by clearing silt which currently makes navigation challenging for visiting craft. The harbour was last dredged in 1989 and is currently badly affected by silt dragged down the River Nairn and sand blowing off the nearby beaches. Pontoons could also be installed to reduce pressure on berthing at the harbour, which currently has a waiting list of 32 boats. Longer term goals include providing a “state of the art” water sports facility which would be capable of hosting international events. The project was revealed at a meeting of Highland Council’s Nairnshire committee, chaired by Mr Green. He told the meeting work could lead to Nairn becoming the “water-sports capital of Scotland”. He said: “The draft proposals from the Nairn Harbour Working Group outline potentially the most exciting development in Nairn for a generation. “Regeneration of the harbour and waterfront area is a strategic priority for Nairn and the creation of a development strategy will be a key action in promoting local economic activity and prosperity. “The imaginative and technically competent proposals outline a vision to develop the harbour into a facility able to attract and accommodate a wide range of boats and yachts, plus develop the area into an international centre of excellence for water-sports. The plans are at a very early stage and will be put out to public consultation. Funding has not yet been sought but Mr Green highlighted a number of potential sources of income for the project from the private and public sectors. However, Councillor Liz Macdonald questioned the timing of the announcement, saying it was a “red herring”. She added: “I’m really interested to see this coming forward and I would love to see future development at the harbour.